Special Containment Procedures: SCP-2948 is currently sealed in a heat-insulated, sound-proof, air-tight, opaque Faraday cage at Area-100. 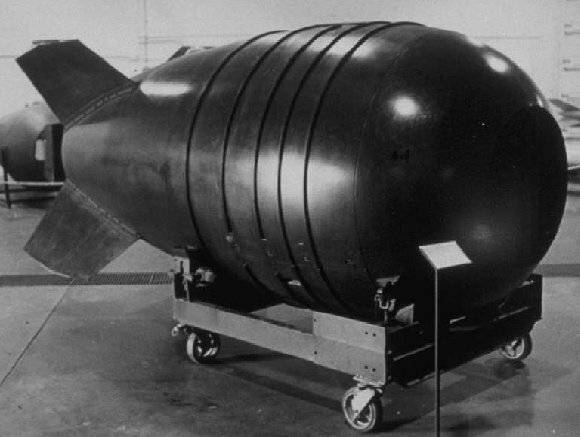 Description: SCP-2948 is currently an implosion-type Uranium bomb that, in the event of detonation, replaces itself in a larger container with a larger payload. The size that SCP-2948 replaces itself at occurs at an exponential growth rate of 37.6% between iterations. The explosive capacity of SCP-2948 has scaled with its physical growth. SCP-2948 has changed explosive mechanism and triggers, but has retained basic nuclear technology congruent with the year 19461. If the current iteration2 of SCP-2948 were to detonate, it would release approximately 1.09 PJ of energy. SCP-2948 currently has a 5 day timed trigger, and six known extraneous triggers: temperatures outside the range of approximately -5C° and 25C°, sound levels above 40 dB, exposure to ambient lighting exceeding 240 lx, electrical currents of over .5 A, kinetic disturbances exceeding 2000 N, and exposure to carbon monoxide above 70 ppm. SCP-2948 arms its extraneous triggers 30.1 hours after each detonation. Due to the difficulty of disarming SCP-2948, only the timed trigger has been directly deactivated; the extraneous triggers have been impossible to disarm without prematurely detonating SCP-2948. SCP-2948 was designed by a team headed by Dr. Paslie Maddison for the American government during The Manhattan Project and Operation Crossroads between 1944-1946. SCP-2948 was created after an attempt to develop a more efficient and attainable fissile material for bombs' cores resulted in an experimental fuel reactor melting down. Approximately 60 kg of a previously unidentified isotope of Uranium (now known as Uranium-240) was recovered from the site of the meltdown. The new material was slated to be used in SCP-2948 shortly after it was deemed to be a suitable explosive. SCP-2948 was successfully detonated under the test name "Dog" near Bikini Atoll in 1946 along side tests "Able" and "Baker". SCP-2948 had not been observed reforming in the debris and water of its previous detonation, and was consequently neglected until it detonated under water again, 5 days later. The American government launched an investigation for the unprecedented explosion, and, after recovering SCP-2948, contacted the Foundation. SCP-2948 was stricken from the public record, and 27 members of the press were administered Class-C amnestics. Dr. Maddison was admitted to ██████ ████ hospital in ████████, Nevada, for a case of radiation poisoning. Upon investigation, a massive warehouse in the ██████ Desert was discovered with enough parts and material to build approximately 12 nuclear war heads, several of which were in various stages of construction and decay. 4 small nuclear reactors were also discovered, 3 of which had been intentionally melted down and stripped for material. It is currently unknown how Dr. Maddison managed to acquire as much nuclear material as he did, but it appears that he purchased most of it illegally, some time shortly after he retired in 1949. Only 4 kg of Uranium-240 was recovered from the warehouse. 110 sequentially numbered notebooks were also recovered from the warehouse. The notebooks contain notes, schematics, and essays in handwriting congruent with Dr. Maddison's that alternate between Dr. Maddison's attempts to reengineer the repeating properties of SCP-2948 in other war heads, and several extensive drafts of a manifesto describing the need to ensure world peace by distributing instances of SCP-2948 to many of the world powers. Dr. Maddison believed that if one country destroyed another, the repeating bomb that the bombed country had received would detonate in the blast as well, and eventually the world would be destroyed from a series of exponentially growing explosions. Several of the notebooks' later entries illustrate Dr. Maddison's frustration from being unable to develop Uranium-240 as efficiently as had been done accidently during the Manhattan Project. Dr. Maddison's notes become increasingly illegible and repetitive near his final work. Shortly after his hospitalization, he was diagnosed with dementia caused by late stage Alzheimer's Disease. It was deemed impractical to administer an amnestic to Dr. Maddison, and instead, upon request by the Ethics Committee, Dr. Maddison was admitted to Site-17 for therapy. 2. SCP-2948 is currently on its 10th iteration.